We team up with enthusiastic charities each year that embark on the Camino de Santiago charity challenge as part of their fundraising activities. 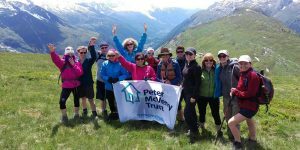 If you are tasked with organising your next charity trek then we are here to help. 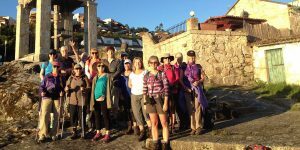 From tailored packages to the most popular Camino routes we have an experienced travel team that will provide you with all of the information you need to make your trek a success. We will look after the logistics, including accommodation, tranfers and meals; and we will also arrange a free information evening for your supporters. To get started visit our fundraising and charity treks page. Parish and church groups may want to experience the spiritual aspect of the Camino journey. In addition to our standard services such as accommodation, transport and guide, we can organise a special area for prayers every evening, as well as coordinating mass at local churches for religious groups on the Camino. Talk to our specialists if you are planning your next big adventure with your walking or hiking club. Each year clubs from all over the world walk some of the most popular Camino routes, including: the Camino Frances, the Portuguese Coastal Camino, the English Camino and the Camino to Rome. There are thousands of kms of Camino trails to choose from. The Camino is recognised as a valuable life lesson for all students. School groups and college students from all corners of the world walk to Santiago every year. The trip is the perfect opportunity to spend quality time with classmates; as well as enjoying the physical challenge of the walk. Every day we speak to people from around the world that would love to celebrate a special occasion on the Camino. You can choose to walk the full Camino Frances or a part of one of the most popular routes and share a very unique journey together to celebrate that special birthday or anniversary.